The most common image of the Crimean War (1854 – 56) is of Britain’s Light Brigade charging to death and glory against Russian guns at Balaclava. Almost equally well known are the epics of the ”Thin Red Line” and of the Storming of the Redan, both in the Crimea itself. The more nautically- minded may think of the enormous and costly expedition to the Baltic that earned such scanty returns. Few have however heard of the most remote operation of the war, the Anglo-French assault on Petropavlovsk, Russia’s Northern Pacific port on the Kamchatka peninsula. 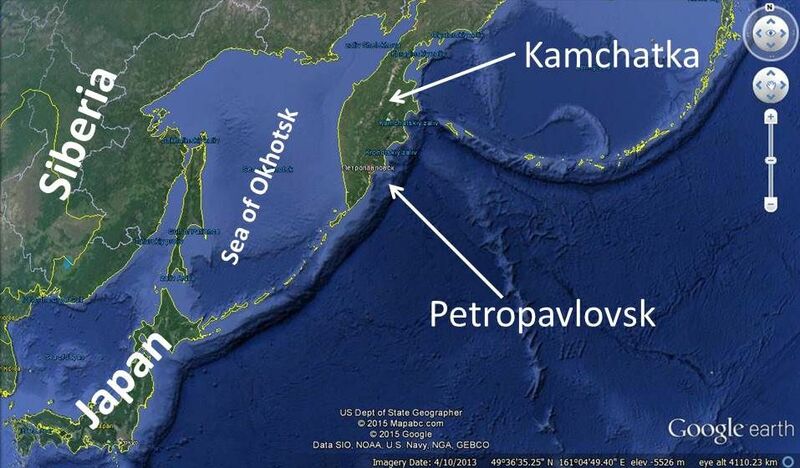 Even for Russians the word “Kamchatka” signified the back of beyond, difficult to the point of near impossibility to reach by land from European Russia. The Trans-Siberian railway had not yet been thought of and would not to be completed for another five decades and the only realistic way of supplying the settlements there was by sea. Kamchatka is a vast peninsula – almost 100,000 square miles – and contains some 160 volcanoes, 29 of them active today – and it is all but cut off from the rest of Siberia by the Sea of Okhotsk. 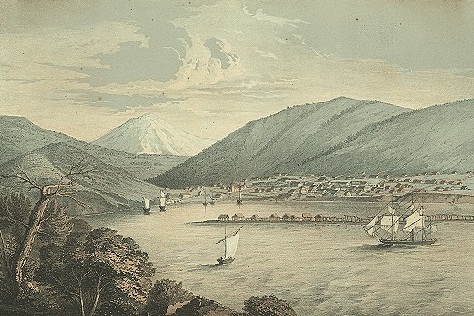 In 1854 Russian presence there was scarcely a century old and the town of Petropavlovsk, founded by the navigator Vitus Bering (of “Strait” fame) in 1740, was important not only as an ice-free port but as a transit point for contact with Russian Alaska. Russia’s interest in Alaska was however never more than lukewarm and its potential was never recognised. It was to be sold to the United States at a knock-down price some thirteen years later. Petropavlovsk is situated on what a Victorian writer described as “one of the noblest bays in the whole world—glorious Avatcha Bay”. By 1854 the city possessed an almost landlocked harbour, with a sand-spit protecting it from all fear of gales or sudden squalls. The shelter it offered, and its freedom from winter ice, made it an ideal maritime base, and in more recent times has been used as such by the Soviet and Russian Federation Pacific Fleets. When Britain, France, Turkey and Piedmont went to war with Russia in 1854 the main theatres of war were to be the Crimea and the Baltic, both offering access by sea. Destruction of the Crimean naval base at Sevastopol and of the Russian fortifications in the Aland Islands, were seen as strategically significant and desirable. It is however impossible to understand how an expedition against Petropavlovsk could ever have been imagined to have any significant impact on the war. Even if held, the occupying force had nowhere else to go and the only Russians inconvenienced would be the two or three thousand engaged in trading in Alaska. 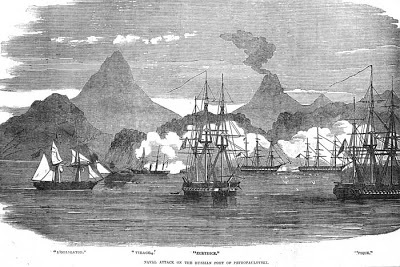 Despite this it was decided that a not-inconsiderable Anglo-French force should be sent against Petropavlovsk. This consisted of six vessels, the Royal Navy’s HMS President (Frigate, 38 guns), HMS Virago (paddle sloop, 6 guns), and HMS Pique (frigate, 36 guns), plus the French La Fort(frigate, 60 guns), Eurydice (corvette, 32-guns), and Obligado (sloop, 32 guns). As only Virago was steam driven the force was in effect little different from one that might have set to sea in the Napoleonic Wars four decades only. The British commander, the 64-year old Rear-Admiral David Price was himself a veteran of that latter period, having been just promoted after 39 years as a post captain. The French force was under a Rear-Admiral Auguste Febvrier-Despointes and, as always in allied operations, the potential for miscommunication and confusion was significant. On paper the Allied force carried some 200 guns, though as almost entirely consisting of broadside ships only half this number could be brought to bear at any one time. 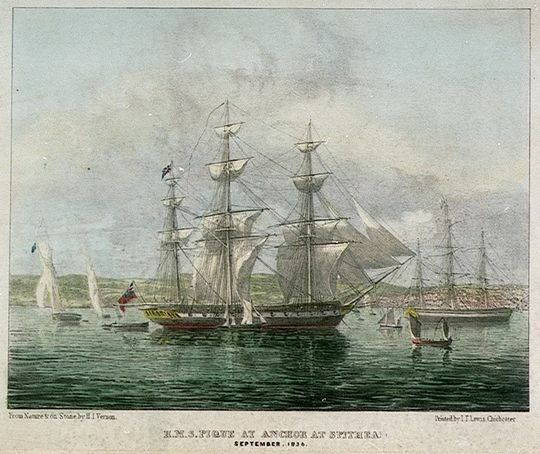 The Anglo-French force entered Avatcha Bay on August 28th 1854 (by the Western calendar) and the less wind-dependent Virago was sent to reconnoitre. The town – little more than a village – was protected from the outer bay by a long narrow peninsula on the west, and a sand bank on the east. Vessels passing between these entered the inner harbour and the passage could be closed by a chain. 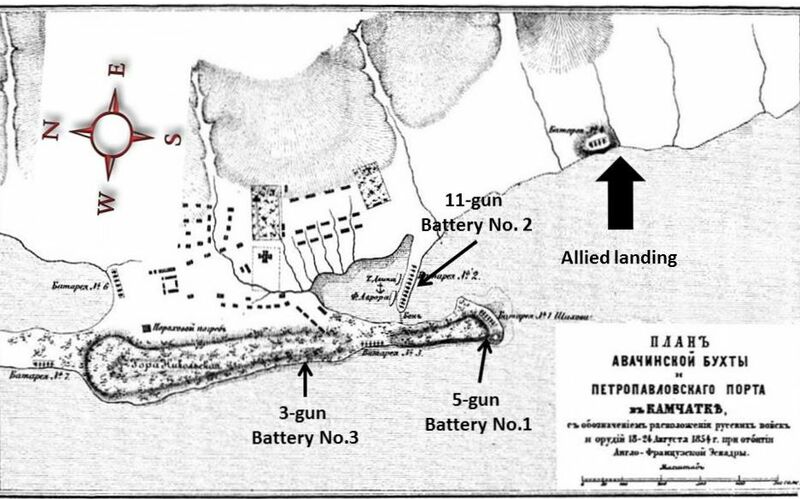 Protective batteries had been located as shown by superimpositions on the contemporary Russian map above – a 5 gun battery at the tip of the peninsula (Battery No.1), an 11 gun battery on the sand bank opposite (Battery No.2) and a 3 gun battery further back along the peninsula (Battery No.3). The total Russian force present amounted to 920 men, seamen as well as soldiers, plus two ships of the Russian Pacific Fleet (indeed almost the entire fleet! ), the 44-gun frigate Aurora and the transport Dvina. These were moored inside of the sandpit and effectively protected by Battery No.2, which they supplemented with their own landed guns. Contemporary Russian Map, with Vanner’s annotations to identify batteries etc. Virago’s reconnaissance complete, the allied force advanced to bombard the town on August 31st. 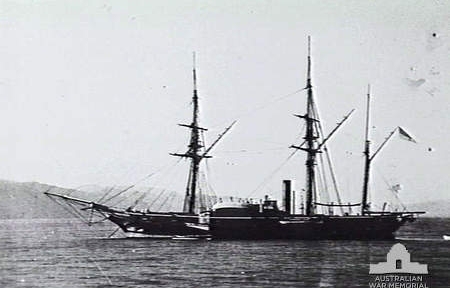 Proceedings were opened by Rear-Admiral Price going below and shooting himself – whether deliberately or by accident, is unknown – leaving British command to devolve to Captain Nicholson of HMS Pique. The bombardment was suspended but on September 4th the force returned, Virago in the lead, followed by La Fort, President and Pique which were to concentrate fire on Battery No.1 while Eurydice and Obligado took on Battery No.3. The bombardment proved successful and both batteries were silenced (an unusual occurrence when ships were pitted against shore batteries – indeed Nelson himself had warned that “A ship’s a fool to fight a fort”). Engaging Battery No2 on the sand spit closing off the inner harbour was however a more difficult proposition since insufficient room was available to being all the Allied ships’ guns to bear on it. Taking the town therefore meant landing men. It was however shut in by high hills on almost all sides and the only vulnerable point was in the south, outside the harbour, where a small valley opened out on land bordering the bay (see old Russian map above). A landing party of some 680 British and French seamen and marines was hurriedly assembled and sent on shore in boats. The landing was unopposed and the Anglo-French force thrust inland in a straggling, ill-coordinated manner. The ground ahead, rising towards a ridge, was littered with scattered bushes and trees, behind which Cossack sharpshooters had been positioned. They opened a withering fire and picked off nearly every Allied officer. The men, not seeing their enemy and having lost their leaders, fell back in panic-stricken disorder. Many had lost their orientation in the brush and a series of small, vicious combats followed, some of the landed force being most likely shot accidently by their own side. A number fled up a hill at the rear of the town and were hunted down mercilessly by the Cossacks while others died by falling over the steep cliff on one side of the hill. 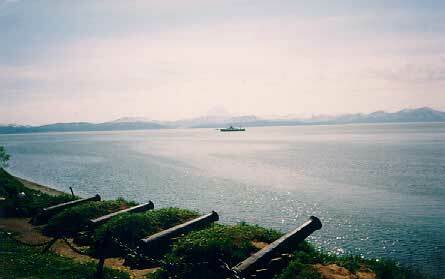 The guns of La Fort, Virago and Obligado covered the main retreat to the boats, but it was clearly a major defeat. The butcher’s bill was 107 British and 101 French dead or wounded out of the 680 landed. The Russians lost half these numbers and held the field. Allied defeat was total. There was nothing to be done by the Allies to withdraw, smarting. The winter made the prospect of further action unattractive but a return in force was soon being planned for the following year. Unknown to allies they Russians had decided – wisely – that Petropavlovsk was of little value to themselves, and a potential liability for the Allies, should they take it. Accordingly, in early 1855, the Russian garrison was evacuated. The Allies were meanwhile assembling a more massive force, with ships assigned to it from the China station. The new commander, Rear Admiral Bruce, organised supplies in Hawaii and a huge supply depot and hospital was organised at Esquimalt, near Vancouver to provide further support. On May 30th 1855 the combined Anglo-French flotilla arrived back at Petropavlovsk in thick fog and took up positions in anticipation of an attack. When they fog cleared two days later reconnaissance revealed the town as deserted. Bruce’s force occupied it without a shot being fired. It was to hold the city until the war came to an end in 1856. The repulse of the Allies at Petropavlovsk was the only Russian success on any front in the Crimean War and as such is remembered better there than in the West. At a tactical level the operation had more in common with the Napoleonic period – sailing vessels, broadside muzzle-loading artillery, improvised landings – than with the era then dawning. The ironclad would arrive within a decade and, fast in its wake, breech-loaders, torpedoes, efficient steam power and ever-improving armour. At a strategic level the operation, whether a tactical success or failure, could only represent a dead-end squandering of lives and resources. For Britain and France Petropavlovsk was an embarrassment. And that is, perhaps, why we have heard so little of it since. Familiar yet with the Dawlish Chronicles novels? Five so far and the sixth due soon. Click on the images below to learn more about the series. Another terrific post, Antoine – how on earth do you find the time to do these and write the books? It’s a pity, though, that you didn’t go into detail about the bizarre and tragic death of poor old David Price. If ever there was a case of a parable for Brexit (whichever side of the fence people are on), it’s a British admiral shooting himself because he couldn’t get along with the French! I’m not sure what happened to the unfortunate man. I suspect that he had a nervous breakdown when faced with the vast range of responsibilities that were far in excess of anything he had encountered in the forty years since the end of the Napoleonic Wars. A really tragic case.